Mayotte (186,452 inhabitants in 2007; 376 sq. km) is made of two islands (Grande Terre, 362.3 sq. km, 80,758 inhabitants, and Petite Terre, 11 sq. km, 13,627 inhabitants) located in the Comoros archipelago, north-east of Madagascar. The status of Mayotte is prescribed by Constitutional Laws No. 1486 and No. 1487, adopted on 23 November 2010 by the National Assembly, promulgated on 7 December 2010 and published on 8 December 2010 in the French official gazette (text). Accordingly, Mayotte became on 31 March 2011 the 101st French Department and the 5th French Overseas Department. Mayotte is also a Region. The Department and the Region are ruled by a single Executive (Conseil départemental) and a single Assembly (Assemblée départementale). The Sultanate of Mayotte was sold on 25 April 1841 by Sultan Adriansouli to Commandant Passot to establish a port for the French Navy. In spite of the opposition of the United Kingdom and of the other local sultans, the purchase was ratified on 10 February 1843 by King Louis-Philippe. Mayotte was formally annexed by France on 13 June 1843. The sultan of Anjouan recognized the annexion in September 1843. Mayotte was incorporated on 29 August 1843 into the Settlements of Nossi-Bé and Dependencies, administrated from Bourbon Island (today Reunion). Separated on 1 January 1846 as a distinct settlement, Mayotte was incorporated from 1896 to 1968 into the Comoros. After the proclamation of the independence of the Republic of Comoros, the claim of the new state on Mayotte was rejected by the inhabitants of the island in two referendums organized in December 1974 and February 1976, respectively. The Comoros have maintained territorial claims on Mayotte, highlighted by the fourth star on the national flag. Mayotte was made a collectivité départementale d'outre-mer by Law No. 616, adopted of 11 July 2001. The official flag of Mayotte is the French Tricolore. The Departmental Council uses a white flag with the emblem of the department, made of the coat of arms of Mayotte and of the writing "DÉPARTEMENT" (top) and "DE MAYOTTE" (bottom) in black letters (photo, photo, photo, photo). "DÉPARTEMENT" and "DE" are written in smaller letters, "DE" being placed vertically on "MAYOTTE"'s left and reading from bottom to top. The emblem appears to be shifted to the hoist. The flag hoisted in front of the (then) General Council of Mayotte (photo, L'Express, 12 April 2004; photo), was white with the coat of arms of Mayotte surmounted by "MAYOTTE" in red letters. The coat of arms of Mayotte, officially adopted on 23 July 1982 by the General Council of Mayotte, is described by the Graphical Charter "How to use the coat of arms of the Department of Mayotte", published on 1 January 2013. The arms of Mayotte are described as "Per fess, 1. Azure a crescent argent, 2. Gules two ylang-ylang flowers gules. A bordure engrailed argent. The shield, in French 19th century style; supported by two sea-horses affronty argent. Beneath the shield a scroll argent inscribed with the motto "RA HACHIRI" in letters sable." The colours of the arms are those of the French national flag. The crescent recalls the Muslim religion while the ylang-ylang flowers represent the main agricultural resource on the island. The engrailed bordure symbolizes the coral barrier, which limits the biggest enclosed lagoon in the world. The sea-horses allude to the silhouette of the island. The motto reads "We are Vigilant" in Shimaore [aka Maore, the dialect of Comorian language spoken in Mayotte]. The arms were designed by Michel Chabin, former Director of the Archives of Reunion island, and painted by a local artist, Pascale Santerre. The font used for the writing is Barmeno Bold, considered as close to the font formerly used by default. Michel Chabin graduated at the École Nationale des Chartes. He was appointed Director of the Departmental Archives of Loz&eagrave;re (1972-1976), Reunion (1976-1982), and Yvelines (1982-1986). From 1986 to 2000, he worked for the Elf-Exploration-Production company, as Head of Project, Head of Service, and, eventually, Head of the Department of Archives and Information. In spring 2000, he founded with Marie-Anne Chabin the Archive 17 agency (website), which developed the Arcateg (TM) method of archiving. 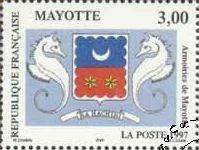 The coat of arms of Mayotte is featured on a postage stamp released by the French postal administration in 1997. The flag is green with a white crescent and four white stars placed vertically, therefore nearly identical to the 1996-2001 national flag of the Comoros.